Teaching a class on midrash! When God created the first man Adam alone, God said, "It is not good for man to be alone." [So] God created a woman for him, from the earth like him, and called her Lilith. They [Adam and Lilith] promptly began to argue with each other: She said, "I will not lie below," and he said, "I will not lie below, but above, since you are fit for being below and I for being above." She said to him, "The two of us are equal, since we are both from the earth." And they would not listen to each other. Since Lilith saw [how it was], she uttered God’s ineffable name and flew away into the air. Adam stood in prayer before his Maker and said, "Master of the Universe, the woman you gave me fled from me!" I wish it were my job to dig into this stuff and analyze it — read: I really, really wish I were paid to do what I've been trained to do — but it's not, and trying to genuinely understand, and make useful predictions based on, what amounts to an enormous document dump (a document mudslide, a document avalanche) can’t be done without first really digging into the material. And, like Emily, I'm juggling my writing life and my desire to be an engaged citizen of the world with the reponsibilities of parenting. (This week, the responsibilities of parenting a fourteen-month-old with his first ear infection.) So I'm not likely to have my own analyses of The Palestine Papers anytime soon. Al Jazeera Unleashes the Palestine Papers by Rabbi Brant Rosen. Rabbi Rosen quotes the Guardian and links to commentary by Diana Buttu (a former member of the Palestinian negotiating team) and Israeli journalist Noam Sheizaf, among others; this is a great round-up of commentary and response. What the Palestine Papers Mean by Mitchell Plitnick, which I first read in Zeek; it's a reprint from The Third Way, Plitnick's excellent blog. "The overriding image that emerges from the leaked documents is the extent to which the Israeli argument that the Palestinians are not 'partners' and are not willing 'to make the difficult decisions for peace' rings hollow. The Palestinians were clearly advancing proposals that were serious; probably much more serious than the Israelis expected or were prepared to deal with." Shoot the messenger: Blaming Al Jazeera for the Palestine Papers by Roee Rutteberg at the excellent +972 Magazine. "The so-called Palestine Papers, the first of which were released this week by Al Jazeera, have fallen into a trap seen all too frequently. Rather than dealing with the actual message and content, those affected by the leak instead have chosen to shoot the messenger." What do Tunisia, Lebanon and Egypt have to do with the Palestine Papers? by Dahlia Scheindlin, again at +972 Magazine. "The protests might be the start of a domino-collapse of authoritarian Middle East leaders. But it feels deeper – like the end of a paradigm. Could this be a tectonic shift away from the culture and mentality of accepting corrupt military or oil dictatorships? Are the people of the Middle East tired of being distracted by a holy war against the Zionist enemy, and ready for a crusade against their leech-leaders?" Based on the essays I've managed to read this week, I get the sense that the Palestine Papers -- like pretty much everything else having to do with the contemporary Middle East -- can be interpreted in a variety of fashions to serve a variety of agendas. I've seen people arguing that this is a revelation of tremendous importance and also that the papers don't really matter, that the papers prove that the Palestinians were serious about peace (and maybe the Israelis weren't) or that the papers prove that the Palestinian leadership was making promises it could never deliver on... In this, as in so many things, one's existing outlook may determine how one interprets this avalanche of new material. Americans for Peace Now has argued (Release of "Palestine Papers" Underscores Need for Sea-Change in Peace Process) that the papers show that "[t]he U.S. has not demonstrated real leadership - failing to hold the parties accountable for obstinacy, intransigence, and game-playing, and for actions that conflict with previously-taken commitments.... American actions have cemented a dysfunctional and ultimately futile peace process." As an American Jew who cares about peace, justice, and the people on both sides of this story, I'm saddened by that assertion. The folks at J Street write "Only bold American leadership can lead to the resolution of this conflict, and we urge the President to act now before it is too late." (J Street on Palestine Papers: Obama Administration Must Step Up.) I'm beginning to feel some skepticism that American leadership can make a real difference here -- but I hope and pray that if it can, it will, speedily and soon. If there's commentary on the Palestine Papers which you've found particularly insightful, feel free to drop links in the comments. If you can, take the time to include a (short! one or two sentence!) excerpt to give us a flavor for what you found interesting in the pieces you choose to share. Thanks, and shabbat shalom to all. Please remember that comments here are moderated; because I have a baby, I'm not always online to approve comments, so if your comment doesn't appear, please be patient and I'll approve it as soon as I can! Please also remember my comments policy -- Israel/Palestine is a subject which tends to bring out the angry rhetoric, and I don't allow that here. The 70 faces book tour goes to Galesburg! It turns out the 70 faces book tour is going to start a bit earlier than anticipated, and in a truly exciting way: in mid-February, I'll be spending a couple of days as a visiting scholar at Knox College in Galesburg, Ilinois! While I'm there, I'll get to speak to some students who will have been reading and discussing part of 70 faces -- specifically, the cycle of akedah poems -- as part of their Feminist Methodologies class, and I'll give a poetry reading for The Caxton Club (the Knox Collge literary organization -- named after the first English printer, William Caxton.) Both of those events are designed for the college community. Rabbi Rachel Barenblat, author of 70 faces: Torah poems, will speak about the Jewish art of midrash (exegetical stories which explore and explain Bible texts) as transformative storytelling, share examples of a few classical midrash which take Bible texts in fascinating new directions, and then share some of her own contemporary midrash in the form of poems from 70 Faces. Followed by Q-and-A / discussion and book-signing. If you're in or near Galesburg (or if you feel like a bit of an Illinois roadtrip in mid-February), I hope you'll join us! Here's information on getting to campus. My deep thanks are due to professor Catherine Denial and to everyone else at Knox who's worked to make it possible for me to visit -- and to my mother-in-law for watching young master Drew while I'm away wearing my professional hat (kippah?) for a few days! The author, age 2 or so. This week's prompt at Big Tent Poetry invites us to find a photograph taken by someone else, and write a poem in the voice (real or imagined) of that photographer speaking to their subject. 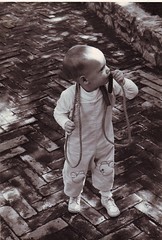 I chose a photograph of me; I think it was taken by one of my older brothers, but I'm not sure! And anyway, this narrator's voice is not my brother's, exactly, though it does draw a bit on some details of so-called "real life." I don't know whether other parents out there have experienced this, but I find that looking at my own baby photos and photos of early childhood is a different experience now than it used to be before I had a kid. Maybe it's that I have more sense, now, of what it was like to be one of the adults tasked with caring for me in those early years. I'm still feeling somewhat in-limbo, creatively, but I'm doing my best to surf the waves of unknowing and to let myself write poems without becoming attached to what their eventual outcome might be. Here's a link to this week's "Come One, Come All" post so you can see what others did with this prompt! It's a little bit strange, not being in school. After more than five years as an ALEPH rabbinic student, it feels weird not to be immersed in the web of weekly conference calls, not to be wrangling with the technical mechanics of iVisit (the webconferencing software ALEPH uses for its teleclasses these days), not to be constantly making and revising homework to-do lists. Not to be actively learning as many different things as my brain can take in. I'm a little bit in limbo this winter: finished with school, but not yet immersed in a new professional paradigm. My spiritual challenge right now is to sit with the not-knowing: to resist the temptation to either write mental scripts for how I think things are going to go, or to try to shoehorn things into place when they're not ready to unfold quite yet. On my ordination day, one of my beloved teachers, Reb Shaya Isenberg, gave me a blessing for savlanut -- patience. He blessed me that I be able to sit with what is, instead of feeling the need to try to "make" things happen. It's a good blessing. I've been remembering it often, of late. It's good to have things to look forward to, but it can be spiritually dangerous to spend all of one's energy anticipating something that hasn't happened yet. Anticipation is tricky: it may be delicious, but it can also lead to tremendous let-down once the anticipated event is over, even if the event lives up to what one imagined in advance. Anticipation is a way of living in the future rather than in the present. But one of the aims of mindfulness practice is to ground us in the here and now. Yesterday is gone; tomorrow isn't yet here. This moment, right now, is all there is. This breath. And now this one. And now this one. The mind naturally tells itself stories: remembered sweetness or bitterness, anticipated sorrow or joy. That's the mind's job. We tell ourselves stories all the time about who we are, about how we came to have the lives we know (or how we will come to have lives which are different someday.) It's okay for me to pause sometimes and remember the extraordinary sweetness of my ordination day, or to look forward some months to the first daffodils of spring. But it's not spiritually healthy to spend all of one's energy looking forward or back. Think about the stories you tell yourself, the stories which keep you looking forward or looking backward instead of being in this moment right now. What's unfolding for you? What's hard about being in this moment -- and what do you think might be the blessings of managing to stay in the moment, even if you have to keep perennially pulling yourself back to the now, and the now, and the now? Because this event is on Shabbat, and many Jews do not carry money or engage in financial transactions on Shabbat, I won't be able to sell books there. If you're coming to that event, you're welcome to either order your own copy in advance & bring it with you, or I may post a sign-up sheet here and ask those who want copies to Paypal me the money in advance so I can simply deliver your copy at Bnai Or. Reading/signing at Congregation Beth Israel, March 16, 7pm. (Books provided by Papyri Books.) I'll read from the book and to talk about poetry, midrash, and finding a mirror for our own lives and spiritual experience in Torah. 53 Lois Street, North Adams. Lunchtime reading at Knesset Israel synagogue, March 21 (presented as part of Jewish Federation of the Berkshires' celebration of Women's History Month). 16 Colt Road Pittsfield, MA 01201. Torah Poems Writing Workshop at the North Adams Public Library, March 24 (part of the Berkshire Festival of Women Writers). 74 Church Street, North Adams. Activate your inner poet with the skilled guidance of Rabbi Rachel Barenblat, author of Seventy Faces: Torah Poems (2011) and award-winning blogger. Together we'll work through guided writing exercises which will help you use a selection of evocative Torah texts as the springboard for your creativity. Experienced poets and beginners alike will delight in this opportunity to encounter world-class poetry on Torah themes and master new approaches to exploring Torah through the poet's art.To sign up, contact the library during the month of March. 70 faces on the Woodrat Podcast! Not long after Drew was born, I had the pleasure of being featured in an episode of the Woodrat Podcast -- episode 3, one of the very earliest episodes, which Dave titled Embodied Miracles. I remember doing the interview standing up in our entry hallway with Drew strapped to my chest in a Didymos wrap, swaying back and forth to keep him quiet enough that I could experience the luxury of an hour spent talking not about diapers but about poems. This week I got to enjoy having a conversation with Dave for the Woodrat Podcast again -- this time, along with Beth Adams of Phoenicia Press; the podcast is all about Torah poems, independent publishing, and 70 faces! Dave writes, "Rachel reads five poems from her new book plus a brand new Torah poem, and we talk about Biblical interpretation, Middle East politics, literary micropublishing, and more." It was an awful lot of fun to do. I hope it's fun to listen to, too. You can listen to it (and enjoy the photos Dave chose to accompany it) at Dave's blog, Via Negativa: Woodrat Podcast 33: Rachel Barenblat and Beth Adams on Torah poems. Thanks, Dave! The text is Psalm 96:12: יַעֲלֹז שָׂדַי, וְכָל-אֲשֶׁר-בּוֹ; אָז יְרַנְּנוּ, כָּל-עֲצֵי-יָעַר -- "Let the field exult, and all that is therein; then shall all the trees of the wood sing for joy." and pale green against the snow. clouds of fragrant steam billow. is what rises, hidden and sweet. This week's prompt at Big Tent Poetry invites us to write a poem about food. If you follow the Jewish seasonal calendar, and/or if you've been paying attention to recent posts here, you know that this week holds Tu BiShvat, the Jewish New Year of the Trees, which I will celebrate tomorrow by eating the fruits of many kinds of trees, from the etrog to the maple -- the subject of this poem. The title is a reference to Psalm 34, verse 8: "Taste and see that God is good." I haven't formally been writing mother poems since I finished a full year's worth of them at the end of November. I've been polishing and revising those poems into a manuscript, tentatively titled Waiting to Unfold, which I hope will see print someday! But this poem wound up being addressed to Drew, so I'm filing it as a mother poem even though it doesn't fit into that nascent collection. I'll edit this post on Friday to include a link to this week's Come One, Come All post so you can see what others wrote in response to the prompt. Until then (and after then, too!) I welcome whatever response this poem calls forth from you! Tu BiShvat, the Jewish New Year of the Trees, is this Thursday! I'll be celebrating it with the kids in our bar and bat mitzvah prep program at our synagogue, and have created a three-page "kitzur" (abbreviated/brief) haggadah for Tu BiShvat which we'll use as the roadmap for our conversations and our learning. I thought some of y'all might be interested in it too, so I'm sharing it here as well. If three pages sounds like more than you want to deal with (or more than you want to print -- save the trees, right? ), and especially if you're psyched about the mystical/kabbalistic resonances of the seder's journey through the four worlds, check out the One-page haggadah for Tu BiShvat at NeoHasid.org. On that page you can also find study materials, suggestions on how to use their haggadah, and a variety of other seasonal resources -- if you don't already know NeoHasid, by all means, check them out. Alternatively, if you're looking for something longer and more in-depth, I posted a longer haggadah for Tu BiShvat back in 2006, which you can download from this post: A new haggadah for Tu BiShvat. But this year I'm excited to be exploring the shortened version; while I designed it for use with teenagers, I hope it will suit adults, too. One final note: this haggadah was written here in the snowbound Berkshires, so it reflects our seasonal experiences -- if you're in a different climate zone (or a different hemisphere), you may need to revise a bit on the fly! On one level, this is a poem about the aftermath of the theophany at Sinai: the divine revelation in which God revealed God's-self to the children of Israel and formally entered into eternal covenant with them / us. (For more, read Exodus 19, starting around verse 16. Or, read this week's whole parsha in English -- parashat Yitro.) On another level, this is a poem about last week -- the week after my smicha -- and the experience of struggling to assimilate that incredibly powerful experience into my existing life. There's always something slightly lonely about coming home from an ALEPH gathering, but that feeling has been heightened for me this time around. I can't help wondering whether the Israelites in this week's Torah portion felt anything like this after their big moment was done. The idea of reading the Name in each others' faces comes from a Hasidic text I studied a few years ago. The text is by the Ropcyzer rebbe, and I translated and expounded on it a bit here on my blog: In Your Face! This is the first poem I've written since I finished my year-long cycle of weekly mother poems at the end of November. I've spent so much time recently with the well-polished Torah poems in 70 Faces, and with the mother poems which I'm beginning to revise, that it feels strange to be pushing up against an entirely blank screen again. But that's part of why I'm sharing this poem here, even though I'm not certain that this is its finished form. Sharing poems here is a good part of my writing practice, and it's part of my spiritual practice as well. I welcome whatever response y'all have to offer. 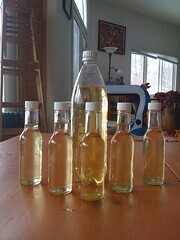 Back in the autumn, I posted about making etrogcello, a variation on the sweet lemon-flavored liqeur limoncello. Instead of being made with lemons, this is made with etrogim, the nubbled citrons of which we make ritual use during Sukkot. I based my attempt mostly on the recipe at When life gives you lemons: peeled the etrogim, set the peels to soak in a large sterile jar filled with vodka, put it in the dark, and waited. 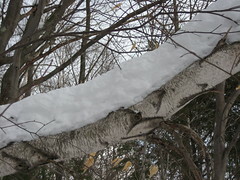 We tasted a tiny bit of it back around the winter solstice (after it had been sitting there for about two and a half months), sweetening our individual nips with sugar or with Splenda. It was pretty awesome. It's bright and citrusy and smells distinctively like etrog, which is an amazing scent and not quite like anything else I know. Ethan liked it well enough that he asked whether we could finish the etrogcello with a diabetic-friendly symple syrup. So I did some digging to see if that would work. On this limoncello recipe, one of the commentors, blgpts, offered insights on how to make limoncello using Splenda instead of sugar. (I also spent some time reading How to make limoncello, an astonishingly comprehensive post about the making of this liqueur. I'd like to note, for the record, that I was not nearly as obsessive about filtering as it sounds like that guy tends to be...) From all accounts, Splenda adapts beautifully to simple syrups. So I made a Splenda simple syrup and added it to the quart jar... and then returned it to the darkness of the pantry, to remain dormant for a few weeks more. The fruits of my etrogcello labors. The little bottles are meant as gifts (at least one is going to Jeff, who graciously gave me his leftover etrogim to work with) and the big one is for us. I'm planning to save it for Tu BiShvat, the "new year of the trees." We'll toast that new year with a nip of our own homemade etrog liqueur -- a reminder of Sukkot and autumn and our sukkah and the crunch of leaves underfoot, a reminder to look back to last fall and also forward to next fall even as we inhabit this moment in deepest midwinter. I love (re)connecting Judaism with its seasonal roots. At the full moon of the month of Shvat, Jewish tradition teaches us, the sap begins to rise and trees begin to nourish themselves toward the growing season that's coming. Tasting the fruit of actual trees helps me to remember that this isn't just an intellectual and spiritual teaching. I love all the mystical teachings about the roots of the Tree of Life, but this isn't only a celebration of those things -- it's a celebration of real live trees and their continued existence, too. Torah is famously compared with a tree ("It is a tree of life for them that hold fast to it"), but at this moment in the year I like to think about the ways in which trees are like Torah: they are beautiful, they nurture us with their shade and their sustenance, and even though they change in appearance as the year unfolds there's something constant and solid about them, something we can hold on to. And Torah is yummy. Just like our etrogcello. L'chaim! At shacharit (morning services) last Sunday morning, my dear friend David Rachmiel told us that he had very sad news to impart. Voice shaking, he told us that Debbie Friedman had died only a few hours before. The room was plunged into silence and sorrow. Somehow we all wound up in a circle with our arms around one another, singing Debbie's "Kaddish D'Rabanan." We ask for peace and lovingkindness, and let us say: Amen. May they be blessed with all they need, and let us say: Amen. We ask for peace and lovingkindness, and let us say: Amen! The kaddish d'rabanan (also known as the "scholar's kaddish") is a variation on the kaddish (the prayer which magnifies and sanctifies the name of God and which acts as a "gate" between different sections of the service -- and which is also recited by mourners.) In this version of the prayer -- which is recited after Torah study -- there's an extra paragraph which translates to basically what Debbie's rendered above. The Aramaic is notoriously tricky for those who aren't accustomed to the words, but her English is clear and singable. I'd never heard her version before this Ohalah. By the end of the conference we'd sung it so often I knew it by heart. I wasn't blessed to know Debbie in life, but I've known her music for as long as I can remember: her tune for the havdalah blessings, her Mi Sheberach (prayer for healing), her dual setting for Elohai Neshama and Asher Yatzar (the prayers for body and for soul.) It seems to me that she had a particular genius for taking traditional texts and rendering them in English and in melody in a way which would be accessible and meaningful to those who heard (and, ideally, learned to sing) what she had scored. This Shabbat is Shabbat Shirah (the Shabbat of Song) when we read the Song of the Sea, that beautiful Torah portion which is laid out on the scroll like lattice. This year at my shul we'll be celebrating Shabbat Shirah in a different way as well: by singing and cherishing the songs which Debbie Friedman gave over to us, with gratitude. After our Shabbat morning Torah study we recite the kaddish d'rabanan in Aramaic, and with that one tricky/unfamiliar paragraph in English. This week I hope to sing Debbie's melody instead. I'm sorry for our collective loss, but so glad to have her music as her legacy. Thank you all so much for the kind words and good wishes on my ordination and in response to the publication of 70 Faces! My cup truly runneth over. Daily Faith and Poetry in The Berkshire Eagle: "[The poems in 70 Faces] take time to think about daily things -- a bottle of milk, talismans on a desk -- and ongoing things -- the names of animals, the urge to make -- and lifelong things -- a baby born in danger, a difficult reunion at a funeral. // They chronicle the round of the year and the quiet, continual effort to walk forward, to think about work and family and the light on the ridge lines." 70 Faces at Tasting Rhubarb: "Here are characters and landscapes of old, familiar stories from the books of Moses retold, repainted in startlingly vivid thoughts and images - the flood wreaked by a God with post-partum depression, the investigation and conjuring of the often absent woman's perspective, the rueful wondering how these stories might have been less harsh and vengeful, how their harshness might serve now as a lesson in compassion. // And so the old stories come right into the texture of our own lives." Read this book at Awkward Offerings: "Reb Rachel engages head-on with a question that nags — what is the downside to this whole taking over Canaan business? There is nothing heavy-handed or polemical here. She could be talking about the ancient Israelites, the modern Israelites, or any of us caught in the situation of getting the better of someone else. In my humble, really good poetry tackles big questions in such a way as to leave the reader with more questions, shaking our collective heads heads in wonder. The good stuff – and here I'm quoting another poem from the book - builds a structure to house what you long for." Thanks to Kate Abbott, Jean Morris, and Sue Swartz for these generous and thoughtful reviews. (If any of y'all out there who've bought the book feel inclined to review it, please do, and drop me a line to let me know you've done so! I appreciate it so much.) Support independent publishing and order a copy of the book here! On an only semi-related note (hey, it relates to me and to poetry), thanks to The Forward for publishing my poem Birch Magazine in honor of the upcoming Jewish holiday of Tu BiShvat. The story of my ordination day in three parts. Part one: the ceremony for new and outgoing talmidim (students). David blesses me with words and with ears. The student community lines up outside of two doors, the soon-to-be musmachim (those who will receive smicha, who will soon be ordained) in one line and the incoming students (accompanied by current-student "buddies") in another. To the sound of drumming and singing, the musmachim enter the room. Our fellow students are sitting in a grand circle, with members of the va'ad interspersed, and we orbit the inside of that circle, dancing, pausing to hug our teachers as we go. There is a smaller circle of ten chairs inside the big circle, and we ten take our seats in those chairs, facing outward as the bigger circle faces in. Then the new students are sung in, and after they circle the room they take their seats in the outer circle with the rest of the students and the faculty. One by one, their buddies stand and introduce those who are new to the ALEPH ordination programs. After each introduction we chorus baruch ha-ba (or brucha ha-ba'ah) b'shem Adonai, "welcome is the one who comes in God's name." There are a string of new Davids entering the program, and as we move around the circle with the introductions, our beloved Reb Elliot rises and pretends to introduce the two teachers on his left and right as "David and David." Laughter washes the room. The new students step forward and stand facing the musmachim, in pairs and trios, and as the community sings we give them blessings for the journey they are beginning which we are about to complete. I bless a dear friend from my DLTI family. I tell her that the smicha program is like DLTI, only bigger and more. I bless her that her journey be as sweet and surprising as mine has been, and that she always have friends with whom to share the path. And then we musmachim stand and are each met by the one student we asked to bless us. My blessing comes from David, who I have known since I was seventeen. First there is an embrace, and when we step back and look at one another, his gaze says volumes. Then he places a pair of rabbit ears on my head and over the singing and drumming and the sound of the nine other private blessings taking place I can hear the room bursting into laughter. I am laughing so hard I'm almost crying. Then David gives me his blessing -- the story of a young rabbi who yearned to become real, the reality that becoming real can hurt, the Voice which says "You were Real to Me because I loved you. Now you will be Real to everyone." -- and I am crying so hard I don't know how to stop. Laughter and tears, tears and laughter. To close, we sing Ivdu et Hashem b'simcha -- serve God with joy -- and there is a snaking spiral dance around the room. The spiral dance breaks into circles: one tight group of men kicking and whirling, other pairs and trios and circles interweaving as we sing. 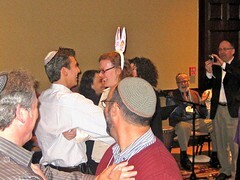 My dear friend Simcha and her husband Shawn pull me into their circle dance for a minute or two. We dance and sing and rejoice. Each of the poems in 70 Faces arose in conversation with the Five Books of Moses. These poems interrogate, explore, and lovingly respond to Torah texts -- the uplifting parts alongside the passages which may challenge contemporary liberal theology. Here are responses to the familiar tales of Genesis, the liberation story of Exodus, the priestly details of Leviticus, the desert wisdom of Numbers, and the anticipation of Deuteronomy. These poems balance feminism with respect for classical traditions of interpretation. They enrich any (re)reading of the Bible, and will inspire readers to their own new responses to these familiar texts. And now you can buy it online for a mere $14! Here's the link where you can buy the book directly from the publisher. And here's the link where you can buy it at Amazon. (More money goes to Phoenicia Publishing if you buy it through Phoenicia, but I understand that Amazon makes life easy; do what works for you.) Berkshire locals will be able to buy copies soon at Papyri Books and Water Street Books in Williamstown; it's also going to be available at the Isabella Freedman Jewish Retreat Center's bookstore. Some of you read early drafts of these poems here during the couple of years when when I was posting Torah poems each week. Several of you asked whether they would ever be available in book form. And now they are! I'm ridiculously excited. I'll be doing events to promote the book in a variety of locations around New England and south Texas as the year unfolds. (Right now I've got readings and workshops lined up in Berkshire County and in San Antonio; others are in-progress. I'll keep y'all posted.) Anyway: I wanted to share my joy with all of y'all, and I hope you will choose to pick up a copy of the book -- and, if you like it, to share it with your Bible study groups, your Torah study chevre, your poetry students and friends, and anyone else you think might dig it too. At the heart of today's smicha (ordination) ceremony are the divrei Torah offered by the musmachim. Our divrei Torah this afternoon will be a collaborative effort. We've chosen ten verses from Torah, spanning last week's Torah portion and this week's Torah portion, parashat Bo and parashat Beshalach. Over the course of these ten moments in the story, we move from Mitzrayim, "the Narrow Place," into the expansiveness of crossing the Sea of Reeds. For us, this story can be read as a metaphor for our own journeys from constriction into freedom... including our journey to ordination today. As we come up, singly and in pairs, to offer words, music, and reflections, we'll invite the community to listen for the narrative throughline which takes us from slavery into freedom, from Egypt into the great wide open. Here are the three poems I will be offering as my d'var Torah. Tu BiShvat, the Jewish "new year of the trees," falls on January 20 this year. May it be your will, O God, who has made us responsible for the deeds of our hands, that this tree will live and grow and bear fruit in peace. Olive trees are not only deeply symbolic (for scriptural and literary reasons we associate them with peace and with plenty) -- they're also a source of income for Palestinians and for Israelis. Torah instructs us in no uncertain terms that even if we are besieging a foreign city, we are under no circumstances to chop down its trees. ("When in your war against a city, you have to besiege it a long time in order to capture it, you must not destroy its trees, wielding the ax against them." -- Deuteronomy 20:19) The wanton destruction of olive orchards is a desecration. Here's a small way to make amends. If you would like to plant an olive tree this Tu BiShvat, Download Plant a Prayer [pdf] and fill out the information at the bottom of the page, then mail it with a check to RHR-NA at the address provided on the form. Hillel would say: be among the disciples of Aaron – loving peace and pursuing peace, loving people and bringing them close to Torah. The ten of us who will be ordained on Sunday (seven rabbis, one cantor, and two rabbinic pastors) are a diverse and wonderful bunch. Some of us are spiritual leaders of communities, some lead organizations, some are chaplains. We teach, officiate at lifecycle events, and lead prayer services. We come from all walks of life, from Israel and across the United States, and we're looking forward to discovering where and how we are led to serve in the years to come. What binds us together is the hope that each of us will be a blessing to the Jewish community and the greater world. In honor of our ordination, my classmates and I are making a collective gift to ALEPH and its seminary. This gift will enable ALEPH to continue to support all who seek to engage with Jewish Renewal’s creative, passionate, mystical and progressive approach to Judaism and will contribute to the education of future rabbis, cantors, and rabbinic pastors. Back in July I posted an invitation to support ALEPH. As my ordination approaches, I'm echoing that call again. If you prefer to arrange a donation over the phone, you can contact Ming, ALEPH's administrator, by calling 215-247-9700 ext 21 (Mondays through Fridays from 1-5pm EST). One way or another, please indicate in the notes to your donation or in the notes field of your check that you're making the donation in my honor, so that Ming will know to connect your donation with the fundraising our class has been doing. Thank you all so much for your support as I have worked toward becoming a rabbi, and thanks for helping me support the seminary which has enabled me to make this dream a reality! So that I may be open to the changes which are coming. 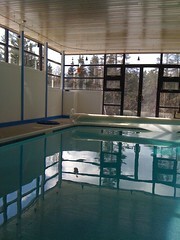 I rescheduled my mikvah for a different place and time: an indoor pool at a friend's house, where I could have solitude and space. It's not a kosher mikvah (it's not fed by living waters), but in midwinter in the northern Berkshires I'm just grateful to have a place where I can immerse in water, period. I've experienced what we in Jewish Renewal call "spiritual mikvah" in swimming pools (and hot tubs) before, and have always come away feeling changed and cleansed. Anyway: the above is the prayer I wrote to recite before my immersions. Those who are attuned to kabbalistic things may notice a hint of four-worlds teaching in the first stanza. (Those who are attuned to poetry things may note that the prayer took the loose form of a sonnet.) I offer this as a gift to anyone else who approaches ordination and wants a mikvah immersion ritual; the rest of your ritual is yours to create for yourself, but you're welcome to use this prayer to set your intention, as I have done.